About this time last year, Digineer had an internal event where we could share messages of thanks. These messages were all gathered up and shared between all of us in our weekly newsletter. I plan to participate again this year but was going to put it out as a blog post. Since I am going that far, I I figured I should try and rope in more people. So in the styling’s of Adam Machanic’s (Blog | @AdamMachanic) T-SQL Tuesday (1, 2, 3, 4, 5, 6, 7, 8, 9, 10, 11, and 12) events. Read all of these roundups and linked posts for some great SQL Server content. And with the feeling of throwing a Xerox at Jennifer and Sean McCown (Blog | @midnightdba) and their recent Un-SQL Friday. I am pitching out an some “What are you thankful for” blog posts to the bloggers that will happen to read this. As many of you may know, this week is the Thanksgiving holiday in the United States and I’d like to know what you are thankful for. Feel free to write about turkey, tofurkey, turducken, your family, or anything else. It’s just a chance to see know more about the people we read about on a regular basis. Link back here and I’ll round up all of the posts I find next Sunday (November 28) to share them. It’s a good opportunity to learn about the people we run into in the community and talk about something that doesn’t include T-SQL scripts. Missed the engagement somehow. Congrats!! 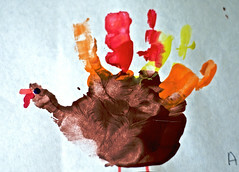 Here's mine: What am I thankful for? Have a great Thanksgiving and another big congrat's on the engagement, Jason (and Sarah)! Here is my post on what I am thankful for. Yeah, I won't be eating tofurkey any time soon. Good idea, Jason. Was going do a post anyway so I might as well link it in… Monday or Tuesday. Adam – which thing? The stuffed turkey roll or the turkey shaped desert thing? So, uh… what is that thing? 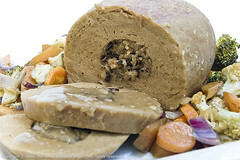 It's tofurkey… I had a picture of turducken but the tofurkey was much more disturbing.